Leading a church brings lots of challenges and when the church is growing, the challenges grow too. Leadership strategies and decisions can make or break a healthy ministry! This book offers an insightful account of how one south London church grew to over 1,000 in 15 years, and the lessons learned along the way. About "Good to Grow: Building a Missional Church in the 21St Century - One Church's Story"
Leading a church brings lots of challenges - but when the church is growing, the challenges grow too. Leadership strategies and decisions can make or break the healthy development of the congregation's life and ministry - wisdom and grace are in big demand! Steve Tibbert, senior pastor of a large and growing church in London, reflects on the lessons he has learned over fifteen years in church leadership. 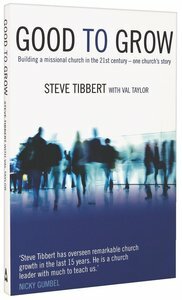 With an easy-to-read and witty account of his experiences, Steve offers tips, principles and cautionary tales that will help anyone starting out on church leadership to take their church on a successful journey of growth, maturity and fruitfulness - and maybe dodge some painful pitfalls on the way. How one south London church grew to over 1,000 in 15 years and the lessons learned along the way. Leading a church brings lots of challenges but when the church is growing, the challenges grow too. Leadership strategies and decisions can make or break the healthy ministry wisdom and grace are in big demand! Steve Tibbert is Senior Pastor at King's Church, Catford. He is also on the Newfrontiers UK Team and helps to oversee Newfrontiers churches in London and Surrey. He is married to Deb and they have three boys. Val Taylor is a staff team member at King�s Church London and when asked by Steve Tibbert to collaborate with him in the writing of Good to Grow she became a surprised co-author! She is also a long-term member of a Poets� Workshop under the auspices of Oxford University. Val is married to Mick and they have been in ministry in the UK since 1978. Unavailable. This item is Out of Print. The publisher is considering whether to reprint. We will hold your order and notify you if they decide not to reprint. eBook is Available.